Measuring The Equity Bubble And The Bond Bubble: How Stretched? Indicators for measuring the Equity Bubble and the Bond Bubble point to vertiginous peaks. Nobody cares. Discussion on pandemics and financial crisis, with Yaneer Bar-Yam systems scientist, and founding president of the New England Complex Systems Institute. The biggest equity bubble out there is in the US: the Nasdaq and the S&P. This is no news, few disagree in market chatters. Nobody is positioned for it, though. Looking at valuation metrics, there is not the shadow of a doubt: Shiller P/E, Hussman P/E, P/Sales, P/Book, EV/EBITDA, Cash Flow Yield, Forward P/E. We consider cyclically-adjusted earnings, like Prof Shiller institutionalized (and won a Nobel doing). To counter one of its most frequent critics, to have included non-normal conditions during the Lehman crisis, we just consider the two top quarters in earnings in the last 40. In spite of that, the resulting pic is still a NASA Space Shuttle that left the orbit. The cartel of ZIRP, 5trn US QE, 5trn US Buybacks, and now late-cycle 1.4trn tax cuts sugar-rush did not go unnoticed in markets. The S&P qualifies as the most expensive in history and pre-history. When compared to potential economic growth, multiples on the S&P500 exceed even those seen during the Tech Bubble in 2000. 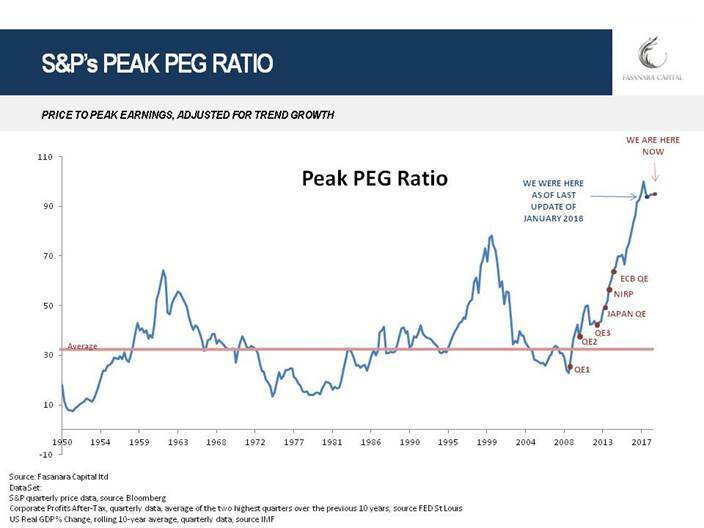 When measured against potential growth, even against its peak earnings in 10 years, the S&P has never before been this expensive before. It is approx. 60% above its historical average fair value. When compared to trend growth, government bonds in core Europe have rarely been as expensive as they are today. They are 250/300 basis point away from equilibrium. Not much further, perhaps. This is what we find out in our studies on market structure and what we call the Tipping Points Analysis (‘TPA’). Our analysis is available in this e-Book, and is further discussed in slides 16 and 17 in this presentation. Let’s be clear: nobody cares about valuations these days in markets. The lack of care is visible across the spectrum of investable assets, public and private: Equities, Bonds, High Yield, Emerging Markets, Venture Capital, Private Equity, Real Estate. It seems that we live through the apotheosis of what Nassim Taleb calls the ‘Bob Rubin trade’: my profit, your losses. A perverse incentive scheme is heavily skewed for money managers to not care, and moral hazard to disseminate across. Regulators, more strangely but not uncommonly to history, turn a blind eye, as ‘you cannot know a bubble, except in retrospect’, they lament. There is crowding in Academics too, Rob Arnott would probably say. Or worse, the ‘Portfolio Balance Channel Theory’ of Ben Bernanke actively goal-sought this out, as output to the experimental model. Call it the key to kick-off ‘animal spirit’ or ‘trickle-down economics’, elegantly. As sober investors though, we should care that nobody does. Tail Risk badly needs complacency as a basic ingredient to assert itself, and compound Systemic Risks. In Complexity Science parlance, complacency is the lack of the negative feedback loop keeping systems at bay, in stable state. Complacency is instead propelling them further out, in thin air stratosphere, where far-from-equilibrium dynamics apply. Our thoughts are expanded upon in this video slideshow. In a big long nutshell, we believe that Systemic Risk in financial markets are best analyzed through the prism of Complexity Science, using the analytical tools available to non-linear socio-ecological systems, where a shift in positive loops comes in anticipation of a dramatic transformation. Chaos theory and Catastrophe Theory can then help shed light on the current set-up in markets. Years of monumental Quantitative Easing / Negative Interest Rates monetary policy affected the behavioral patterns of investors and changed the structure itself of the market, in what accounts as self-amplifying positive feedbacks. The structure of the market moved into a low-diversity trap, where concentration risks of various nature intersect and compound: approx. 90% of daily equity flows in the US is today passive or quasi-passive, approx. 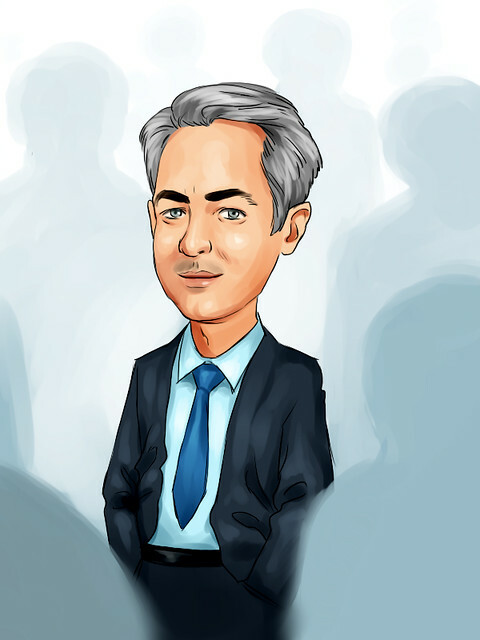 90% of investment strategies is doing the same thing in being either trend-linked or volatility-linked, a massive concentration in managers sees the first 3 asset managers globally controlling a mind-blowing USD 15 trillions (at more than 20 times the entire market cap of several G20 countries), approx. 80% of index performance in 2018 is due to 3 stocks only, a handful of tech stocks – so-called ‘market darlings’ - are disseminated across the vast majority of passive and active investment instruments. 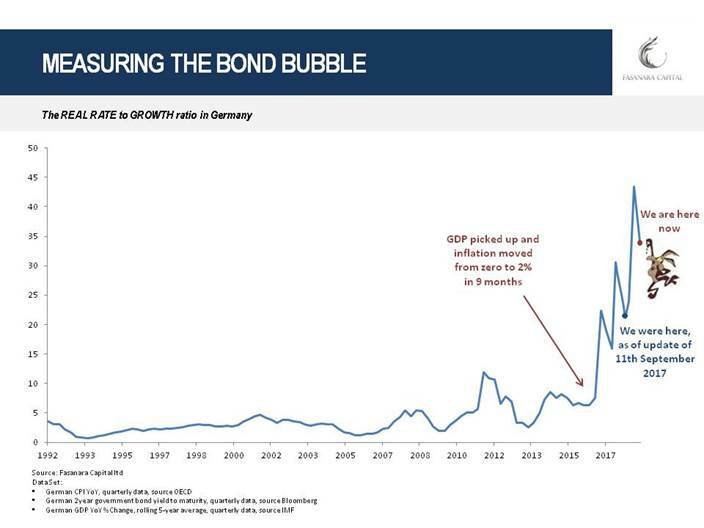 The morphing structure of the market, under the unequivocal push of QE/ZIRP new-age ideologism, is the driver of a simultaneous overvaluation for Bonds and Equities (Twin Bubbles) which has no match in modern financial history, so measured against most valuation metrics ever deemed reputable; a condition which further compounds potential systemic damages. The market has lost its key function of price-discovery, its ability to learn and evolve, its inherent buffers and redundancy mechanisms: in a word, the market lost its ‘resilience’. It is, therefore, prone to the dynamics of criticality, as described by Complexity Science in copious details. This is the under-explored, unintended consequence of extreme experimental monetary policymaking. A far-from-equilibrium status for markets is reached, a so-called unstable equilibrium, where System Resilience weakens and Market Fragility approaches Critical Tipping Points. A small disturbance is then able to provoke a large adjustment, pushing into another basin of attraction altogether, where a whole new equilibrium is found. In market parlance, more prosaically, a market crash is incubating - and has been so for a while. While it is impossible to determine the precise threshold for such critical transitioning within a stochastic world, it is very possible to say that we are already in such phase transition zone, where markets got inherently fragile, poised at criticality for small disturbances, and where it is increasingly probable to see severe regime shifts. Fragile markets now sit on the edge of chaos. This is the magic zone, theorized by complexity scientists, where rare events become typical. A generational opportunity hidden in plain sight. Its status of loneliness and ‘vox clamantis in deserto’ makes for potential outsized returns. Beware Buffet’s Words: These 3 Critical Stock Market Indicators Signal Huge Losses Ahead. How Much Time Do You Have For Bubbles?